All of the highlights from the Heat's regular and post season and a behind-the-scenes look at one of the most talked-about teams in all of sports, including exclusive interviews with LeBron James, Dwyane Wade, Chris Bosh, Mike Miller, and head coach Erik Spoelstra as well as coverage of the Heat's Finals practices and the championship parade. Miami, July 17, 2012 - Beginning Thursday, July 24, Miami Heat fans can relive all the best moments from the championship run in the Miami Heat 2012 NBA Champions Film. In a first for the NBA, Bombo Sports & Entertainment will bring fans all of the highlights from the Heat's regular and post season in a DVD/ Blu-Ray Combo Pack. Produced by NBA Entertainment, the film provides a behind-the-scenes look at one of the most talked-about teams in all of sports, including exclusive interviews with LeBron James, Dwyane Wade, Chris Bosh, Mike Miller, and head coach Erik Spoelstra as well as coverage of the Heat's Finals practices and the championship parade. Bonus features include James' Top Career Playoff Moments and the Top 10 Moments from the Miami Heat regular season and post season. "This was a Finals that every sports fan will remember and NBA Entertainment has done an outstanding job capturing not just the story but the spirit and emotion of the Miami Heat's ascension to the championship," said Paul Doyle, Executive Producer for Bombo "For the first time, this film will be offered on DVD and Blu-Ray together so that fans can own this piece of history without concern for format." 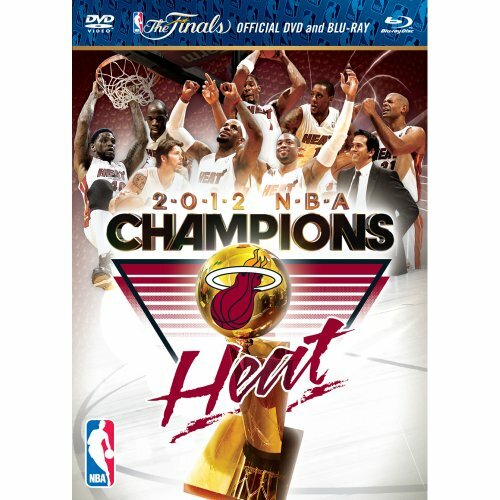 Miami Heat 2012 NBA Championship: Highlights DVD/Blu-Ray Combo Pack is available for $24.99. Fans can pre-order now on NBAStore.com and other major e-commerce retailers. The film will hit stores Tuesday, July 24, and will also be available on iTunes. Founded in 1999, Bombo has produced and distributed over 50 sports films and television documentaries across North America, Europe and Asia. They have established themselves as one of the premier producers of sports documentaries with extensive experience and relationships in all layers of the sports industry from leagues, teams and players to sponsors and media partners. Bombo has been the NBA's home video partner since 2010 and is also the Home Entertainment partner for Manchester United. For more information, please go to www.bombo.com. NBA Entertainment (NBAE) is one of the largest suppliers of sports television and Internet programming in the world, and manages television, film, Internet, publishing, photos, consumer products, marketing partnerships, media properties and event relationships domestically and internationally for the NBA, WNBA, and NBA Development League.